Δελτίο τύπου: «After spilling gallons of blood and fighting tirelessly, after only two albums with Napalm Powerwolf shot straight to the pole position of the official German album charts (and another album made it into the top three!). After selling out venue after venue and thrilling bigger and bigger hordes of fans, the time is right for a new chapter: The Sacrament Of Sin which offers a dozen metal psalms forged for all eternity! 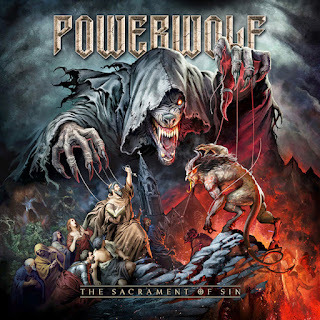 Powerwolf entered Fascination Street Studios in Örebrö, Sweden starting in January 2018 to work on their seventh manifesto together with renowned producer Jens Bogren (Opeth, Arch Enemy, Amon Amarth). The result is brimming with the Germans trademark sound, and yet the band have recorded their boldest and most adventurous album to date! "Where the wild wolves have gone" even marks the first ballad in Powerwolf history - whereas "Nightside of Siberia" does the exact opposite and turns out to be one of the heaviest tunes the fivepiece have ever written. "Incense And Iron" simply MUST be part of every future setlist with its folky nature and anthemic catchiness; and epic single "Fire & Forgive" brilliantly melts infectious melodies into timeless, heavy shredding. Video: "Demons Are A Girl's Best Friend"
METALHEAD 30 Μαΐου 2018 - 8:52 μ.μ. Στα ξεκινήματα μου άρεσαν. Μετά άρχισα να τους χάνω. Παραέγιναν mainstream. Δεν έχω άποψη για τα τελευταία τους άλμπουμ. BALADEUR 4 Ιουνίου 2018 - 8:17 μ.μ.